Tweet: "I hear you fella! Choc ice is classic! hahahahahahha!" After Ashley Cole gave his testimony in the criminal trial of Chelsea captain John Terry who was accused of racially abusing Queens Park Rangers player Anton Ferdinand, a Twitter user tweeted: "Looks like Ashley Cole's going to be their choc ice." Now, we have no clue what the hell "choc ice" is supposed to mean. In the U.K., it's understood to be analogous to an "Oreo," a black person who acts white. 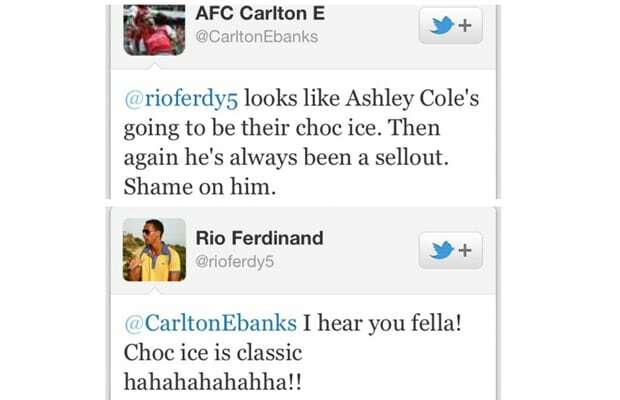 After reading the tweet Ferdinand's brother, Rio, replied with the above text.